This book is read by multiple narrators, which is both a blessing and a curse. Let's be honest, you can't win them all! Khristine Hvam is one of my favorite narrators. She has a way of reading so that you really feel every emotion that the character might. In this series she is Pressia, and I think she does a wonderful job of bringing her to life. Casey Holloway reads the part of Lyda, and I was less than in love with her reading. It's not that she was boring persay, but her voice is much more flat than Khristine Hvam's. Kevin T. Collins reads for El Capitan, and I honestly loved him! At first I thought it was a little over the top, but after a while I couldn't read the book without adding his voice for El Capitan. He's passionate about the character, and it shows. Finally, Pierce Cravens reads the part of Partridge. I thought his voice was pretty spot on, but it was so quiet! I'm sure that's the fault of the audio book company, but each time it came to a chapter narrated by him I had to turn up the volume. Audio Book Rating: 4/5 - Pretty good! I'd recommend it. Well Julianna Baggott, you've done it. You've stepped right on up to the shelf that holds my absolute favorite authors. It's not often that I find a trilogy to fall in love with. It's even less often that I find the middle book of a trilogy to be utterly perfect. 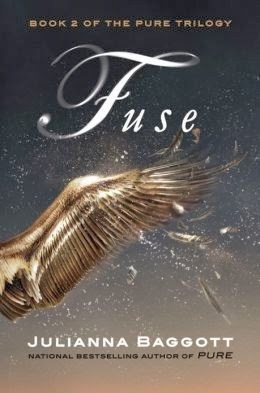 Fuse took everything I was pining for at the end of Pure and wove it into something beautiful. Something I wasn't expecting. Something I couldn't stop reading. I felt at home as I reentered Pressia's shattered world. It was just as I remembered it. Everything in shambles. Ash floating on the air. Humans and animals fused in both beautiful and grotesque ways. This is one of my favorite dystopian worlds. The "After" is built with careful hands, making it easy to get lost in the story. The best part this time around? The scope is so much broader. I was treated to sprawling deserts, abandoned relics, and even woods that housed dark, squirmy things. Plus there is so much more about the dome in this installment. If you missed learning more about it the first time around, you'll be just as happy as I was. The characters are also just as vivid as they were before. Each one unique, created with real emotions and flaws. I've never been able to choose a favorite character. Pressia, Bradwell, Partridge and El Capitan all have things about them that I both love and rage at. Trust me, if you're a character driven reader you'll easily fall into step with Pressia and her friends. What sealed the deal for me was the plot. There have always been themes of morality and mortality in this series. In Fuse, however, lines start to blur. There is no longer a solid choice between good and evil. I loved that. I couldn't get enough of it. We all know the world isn't perfectly black and white. We all know that there are always hidden agendas and secrets behind every door. Baggott shows that in Fuse. She shows that no matter how the world changes, people will always be fundamentally human. Survival knows no bounds. I could gush on and on. I honestly could. This trilogy has shattered my heart twice now with the cliffhanger endings, and yet I just keep coming back for more. Beautiful world building, wonderfully designed characters, and a quick moving plot. What more could you ask for? If you haven't already started the Pure series, I highly suggest you get on that. It's worth it.